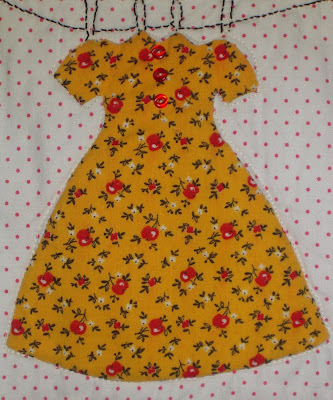 Angela at Cottage Magpie is having a color challenge for April with a prize drawn May 4th to entice us to join with her in a little scavenger hunt around our homes for beautiful items in yellow. After browsing at my blog skip over to Angela's blog and read the rules to play the game along with everyone. 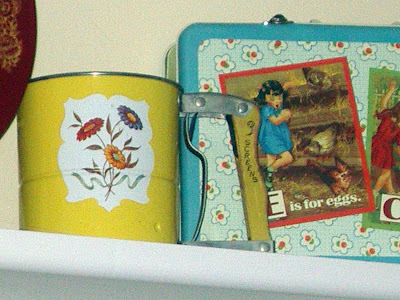 On a high shelf in my kitchen I have some vintage or vintage inspired things. My yellow there is a vintage flour sifter. It works just like new and is in wonderful shape. It is kind of a special "find" of mine. 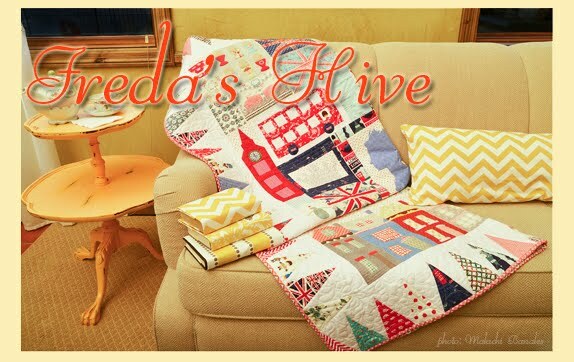 Of course there is the Freda's Hive quilt featuring bees and lots of yellow. My grandfather Peter Nielson (Freda's father) was a beekeeper in Huntington Utah. And I do love dishes and the shape of teapots. 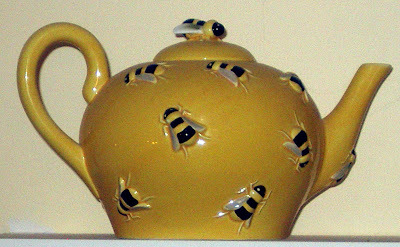 This one combines my love of bees and the love of teapots. 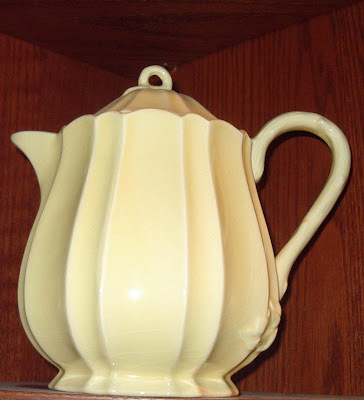 This yellow teapot was given to me by daughter. Its purely for art sake. I don't drink tea. Colorful hand towels hung by my kitchen sink make me happy. 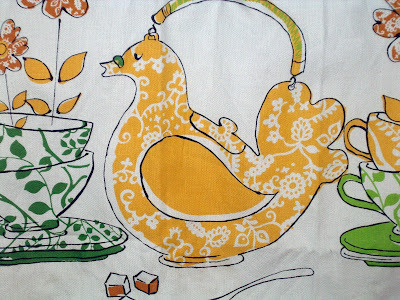 I like this yellow chicken towel. 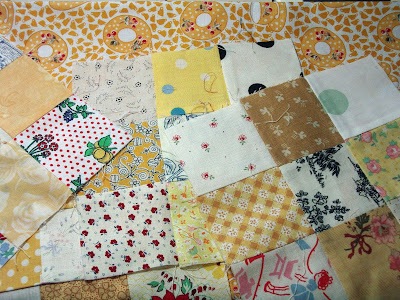 I don't have lots of quilts that are yellow exclusively but thinking about quilts and this challenge has given me the idea that I need to make an all yellow quilt. So now thats on my list. 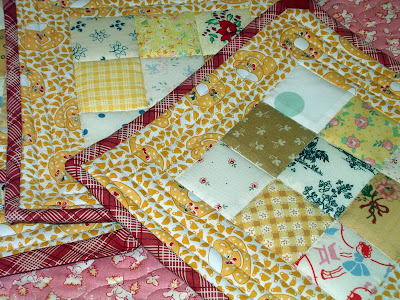 But I do use yellow as an accent color in many or even most of my quilts. I have lots of fabric with yellow on my shelves, its such a pleasing peaceful color, don't you think? 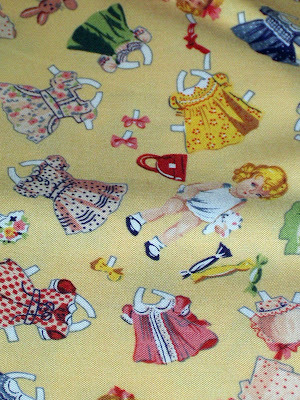 This is a vintage fabric in a glazed cotton with yellow and brown gingham and kitchen items dotted around the fabric. 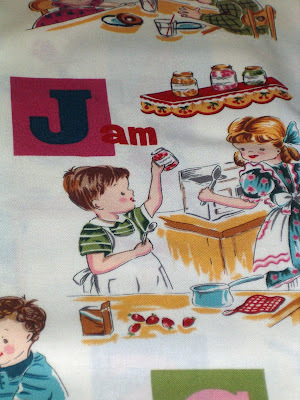 I remember my mother making glazed cotton curtains for our kitchen when I was a girl I think I will wash this (the glaze washes right out) and then use it in my kitchen themed quilt I'm planning for later this year. Another yellow also given to me by family. I have yellow walls in my kitchen and more of a golden yellow/green paint color in my sewing room and living room. 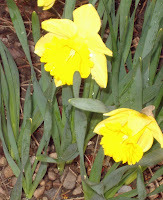 Yellow surrounds me and it really is a cheery color of spring. My Dear Jane blocks from the weekend aren't finished yet and I'm not really that happy with a couple of them. But oh well. I'll catch up during the week I guess. I have so many things I want to do and have been sketching and planning to do but having the time to fit them all in is always a problem in balancing my life. I know we all face that issue. Especially this time of the year. 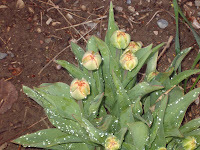 Its spring! So many things inspire me. Anne Sutton inspires me. Thank you for this fabric, Anne. She is truly great person with so much talent. I can't wait to see what is released after Quilt Market. I know I'll be inspired by so many things that are coming out soon. 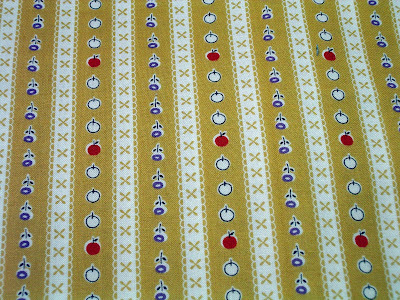 I've got a kitchen themed quilt I've been planning for ages and this fabric has made me decide I should make it using the colors in this fabric and make it playful. This fabric inspires me on ways I can change my dress quilt pattern to make it more unique. 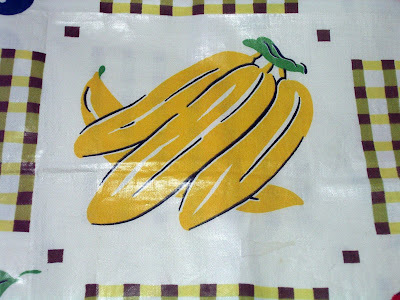 This fabric just came out. I like it almost as much as this border fabric I'm using. 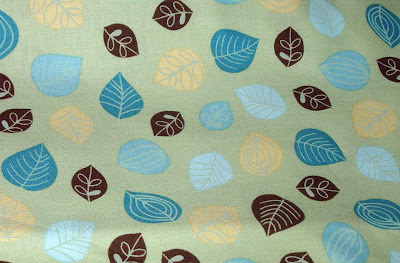 I think the leaf fabric above is more affordable to feature in kits when I put out my "Leafy Treetops" pattern. Of course spring inspires me. 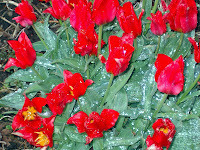 Unfortuantely frost is still present in the mornings here and in this picture it makes the flowers look like they are sprinkled in white. Thinking about our garden this year inspires me. Well not "me" actually. 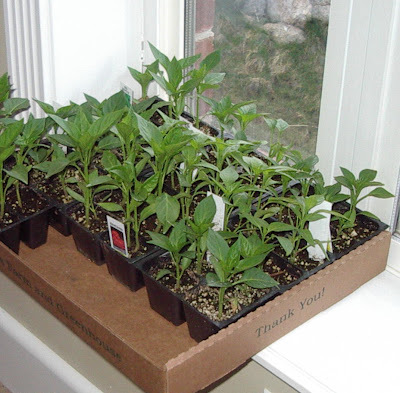 It makes me want to inspire my husband about what I want him to plant! But peppers are definately on the list. Its been a busy couple of days. Sometimes working full time doesn't give me the free time I need to get things done that I really want to at home but its a good job, I'm not complaining. Pam always asks what her "peoples" are up to. I consider myself one of Pam's peoples. So here it is. I needed to make a couple gifts for friends (one belated) and I went to my box that holds UFOs, unmade kits, and orphan blocks. I picked out some scrappy 9 patches from several years ago just waiting to be used. 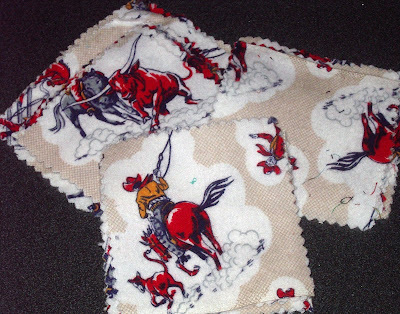 I went to my stash and pulled out this teacup fabric to border and back hot pads I thought would make good gifts. 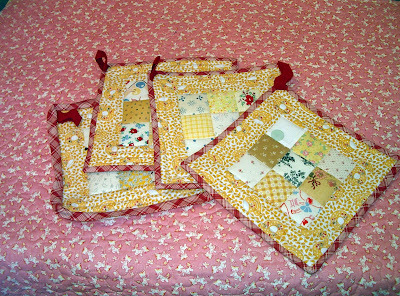 Then I quilted with double batting and made them into pot holders. I'm not quite finished hand stitching the binding yet. I love that pinky red bias plaid from Barbara's fabric line several years old, again from the stash (when is she going to make another line of fabric anyway?). I looped some large rick rack in one corner so they could be hung up. Using up things on hand always makes me happy, especially when I can make something cute and practical. I think they turned out nice for gifts. 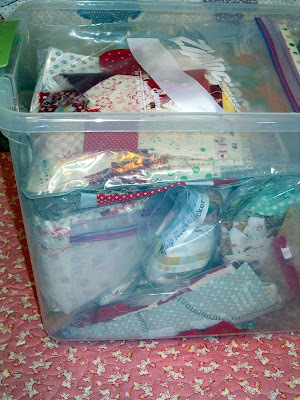 I have about 20-30 of those scrappy blocks left over so I potentially make lots of potholders. And they are fun to make because I can turn them out in a flash. Whitney came over last week made a baby quilt (again from my stash) for a friend. 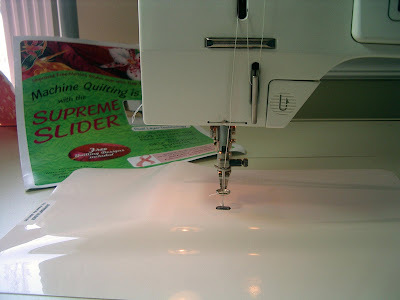 I offered to quilt it for her and try out my new quilting gadget. Its called the Supreme Slider. You can see its in place above on my sewing machine. It has that little hole for the needle. 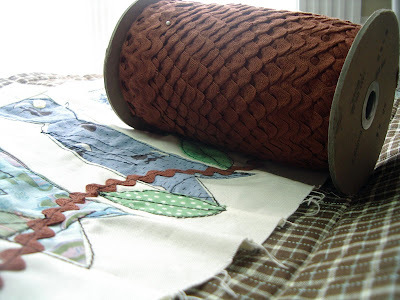 The underside is kind of a rubbery plastic that sticks to the machine table and the top is Teflon coated so the fabric moves better when you move the quilt around to stipple. I thought it was going to be a lot bigger and was kind of surprised at the size when I opened the package. But it really does the job. 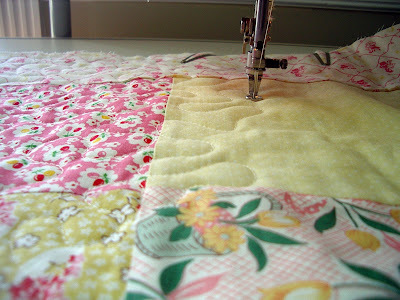 I still wore my gloves when I quilted but it made a huge difference in the ease of free motion quilting. I felt my stitches were more even and my shoulders didn't tire too much. The site that sells the slider has that 'lickity grip' product I may try, too. 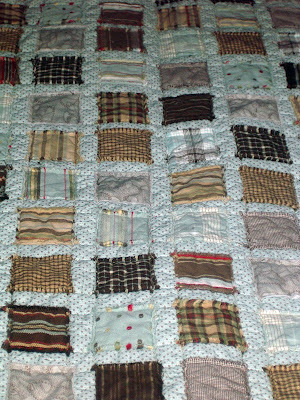 So while I quilted the baby quilt I watched Ground Hog Day. Its probably my favorite movie. The first time I saw it at the theater I hated it. It was frustrating and I ended up like Phil Connors just wondering when he was going to get out of that day. The 2nd time I watched it I relaxed enough to discover the meaning of the movie and enjoy the cute humor and funny lines. Every time I watch it I laugh at the same parts and enjoy the movie more and more the older I get. I love the part where Phil and Rita are at dinner and she tells him she majored in 19th Century French Poetry and Phil says "What a waste of Time". So funny. That movie has so many great lines. And I love Bill Murray. Anyway here is Whitney's quilt all ready for her to hand stitch the binding. It turned out very sweet. Its kind of a raspberry lemonade quilt. Now I need to work on my Dear Jane blocks. I'm behind by 4 blocks but I think I can catch up fairly quickly. So off I go. Camille has a really cute pattern company and blog. I visit the blog from time to time but I don't know why it takes a bit to load. So be prepared. Anyway she's having a give-away for a finished quilt. 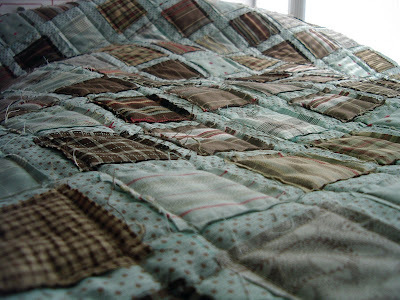 It's a darling quilt and its worth your time to go look at it and enter her drawing. Don't pay any attention to how many have already entered. Its just fun to participate anyway. 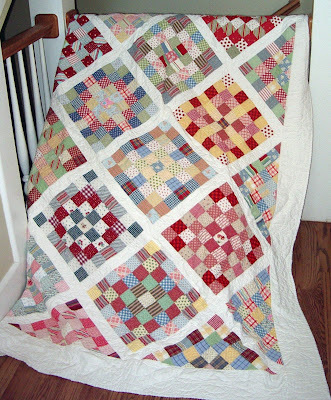 Also go see Des at Taffy Talk and read her take on the Vintage Baby Quilt I've been struggling with (see 2 posts below). She's got a cute blog. Apparently she has conquered the beast enough to keep making them and she even sells the kits. I will say I like the colors on hers much better than the browns. I guess I should never say never. I think all of us love new fun things. Its exciting to open the mailbox and see a package inside. A month ago I was a very lucky winner of a drawing from Jane at her Posy blog, and this week I recieved the exciting package. I thought I was just getting 1 cleaning cloth Jane sent from Devon, England. But it was a package of 3 cloths. I wish you could feel them. They are so soft and the perfect size. And along with the cloths was a darling purple crocheted heart. I love it. I want to make some myself now. 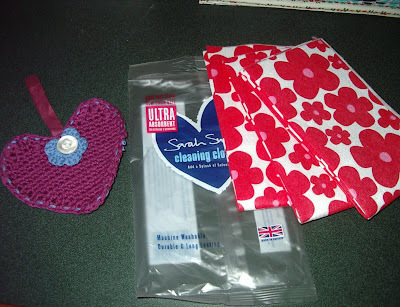 I've never seen anything in the USA like these Sarah Smith Cleaning Cloths. So if any of you know where I could get them in the US please tell me. I think they'd make a great gift. It says on the package "ultra absorbent". I can hardly wait to spray my granite counter top and wipe it off with my new cloths. I don't love cleaning but I'm excited to use these. And what better color could she send me? Perfect. Thank you so much Jane. Look at Jane's header on her blog. Wouldn't you just love to step through the screen into that beautiful setting? And how about getting something "just because"? 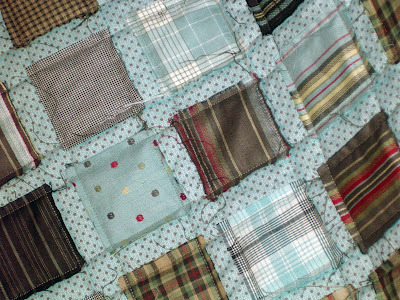 Eileen saw that Diane had sent me some cowboy fabric from Arizona and so Eileen sent me these very cute cowboy flannel squares. They are also really soft and will add a special touch to my next cowboy baby quilt. Thanks Eileen! Eileen lives in Ohio. Its so fun meeting people with similar interests from all over the world. And yes new fabric. I couldn't resist. I love how Kimberly at the Fat Quarter Shop folds and packages her orders. And of course I reuse the twill that is tied around the fabric. I have future plans for these new pieces. 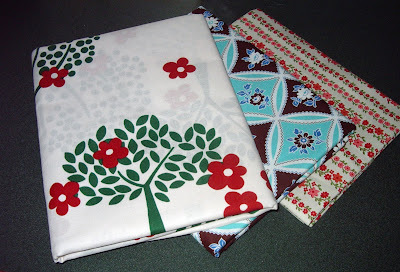 I am loving leaves and trees, its a happy fabric I can see as a border. And that tiffany blue and brown from the new Bell Bottom line I couldn't resist, its unique. 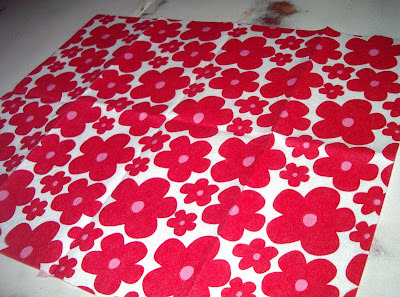 The pink and red flowers I'm adding to my baby quilt stash. Pink and red together is a favorite combination. And last I got a new wireless mouse at Costco. My old one wore out so slowly I didn't realize how completely disfunctional it was until I got the new one. 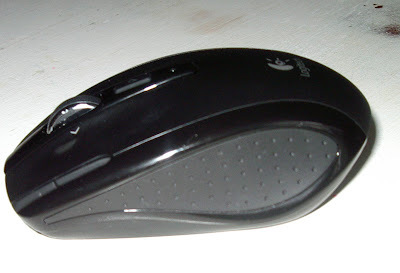 I've never had a wireless mouse before and I highly recommend it. Getting the baby quilts out of the dryer I was extremely worried. Luckily the squares were intact but they were kind of a snarly mess. The quilt in the background hasn't been dethreaded yet. 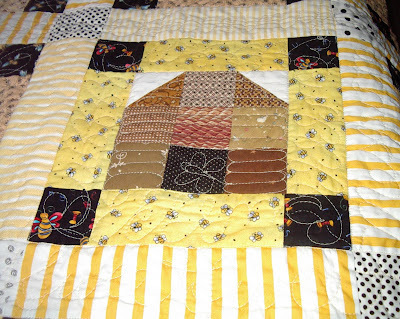 The quilt in the forefront had all the loose threads clipped. You wouldn't believe the pile of thread I got just in 1 washing. I'm pretty sure it will shed some every wash, maybe? So this is what it looks like now as a completed now. They are cute quilts. 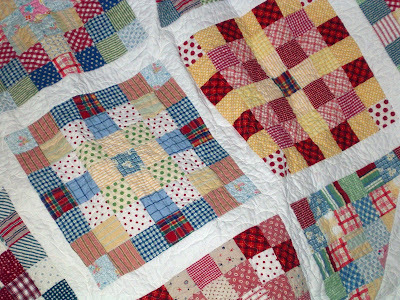 I do worry that some of the homespun types of plaids will not hold up as well to a wash and wear type of quilt that most baby quilts are. If they were my quilts I would try to wash them as little as possible. I know these types of quilts are popular and they have a charm to them even though that might not be something I would really pick out myself. From far away . . . cute. Close up - looks like? A week or so ago my friend Jan (the painter) brought me 2 quilt kits for baby boy quilts. Jan and I have this great trading agreement and I'm building a trade for a new painting by making quilts. 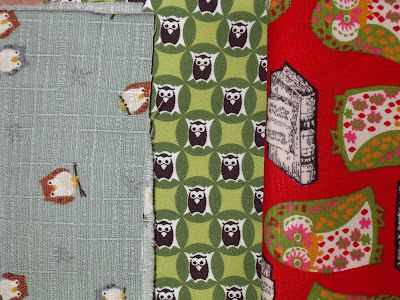 These quilts are for twin boys that will be Jan's grandnephews due in July. 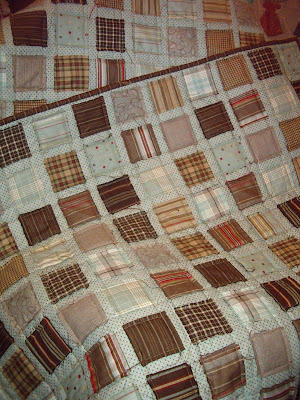 Now I do love to make baby quilts and I was happy to make the quilts. The picture (far away) on the pattern looked pretty straight forward. It appeared to be sashed squares and because I'm a fan of squares I thought, "hey this looks fun and I can do it fairly quickly". Wrong. The picture did not show the real story. The pattern and kits came from a store in another state that Jan's sister picked up, so this is totally not Jan's fault. Or her sister's, probably. 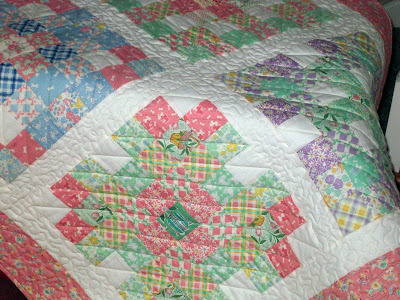 If you didn't open up the pattern and read it you'd never know how weird the method is for making these quilts. I read the pattern the night Jan dropped off the kits and then the next 2-3 days I spent thinking "What have I gotten myself into?". The pattern essentially calls for measuring and making a grid on the fabric top, cutting out squares, and then top stitching and quilting the squares onto the grid through all layers, leaving rough edges on top and loose threads exposed. 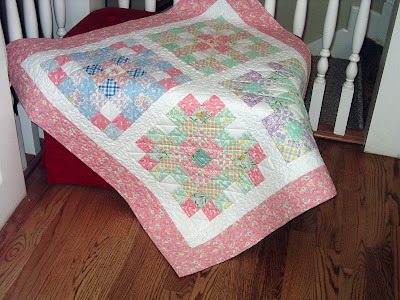 I'm a pretty traditional quilter like most of us, so even Buggy Barn can throw me. I couldn't wrap my brain around this concept. I even called the quilt store where the kits came from to make sure I wasn't misunderstanding. 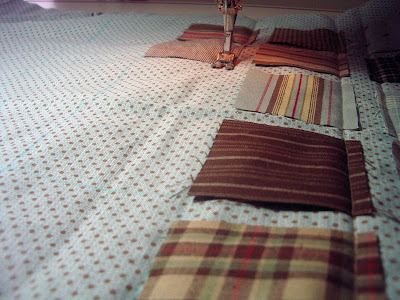 And then it was pretty tricky to keep the blocks straight, stitching lines straight and machine quilt all at the same time. 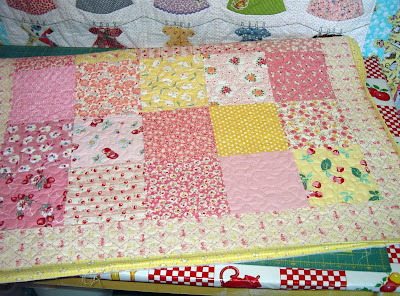 Anyway thats done, the quilts are bound and now the next step is to wash them. The instructions say to wash the quilt and then "clip the strings". I would normally call them threads, but I haven't seen what happens to these after washing yet - yikes. 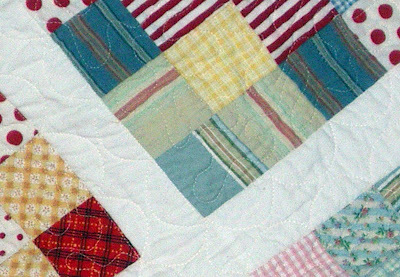 My fear is that the quilt blocks will fray past the quilting lines and into the squares. So long story - here are the "before the wash" pictures. I have to say it is cute from a distance but I'm not really sure about close up. 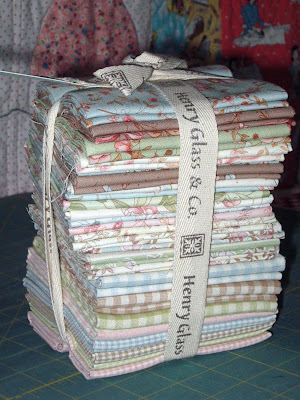 And of course I love Anne's Miss Emma fabric on the quilt tops. 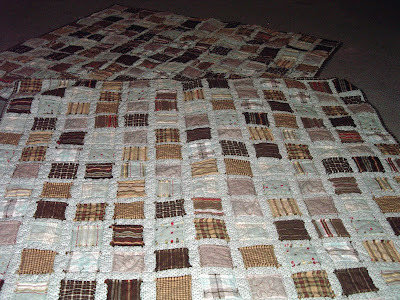 I really like the simplicity of patchwork squares. It is a theme in many of my quilts. And I think this is a good example of simple squares making up a pleasing design. Four years ago I spent a great deal of time making this quilt for our king sized bed. When I saw this pattern in Vintage Quilts Spring 2004 (Mosaic Tiles quilt) I knew I had to make it. 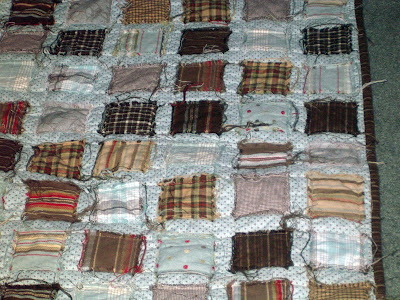 It was a huge undertaking because each of the groups of mosaic squares in the quilt are different. I wanted to make it as close to the pattern/picture as possible using similar colors and patterns. I purchased fat quarters mostly in plaid, stripes and dots. I used a few flowery prints as I ran out of the stripes and checks and needed some variation. 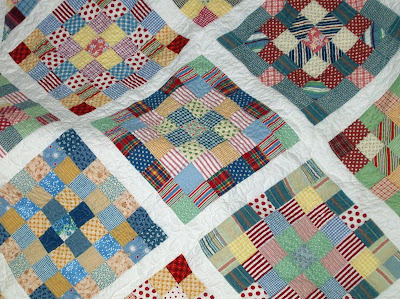 It was impossible to duplicate the fabric in the quilt with what was available to me at that time but I tried to stay as true to the theme of the original as possible. 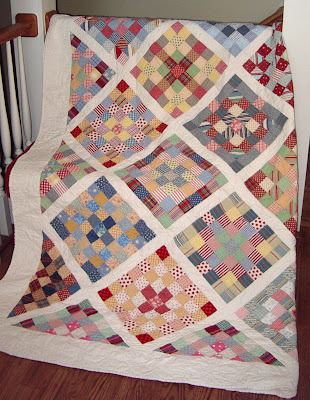 If I had the time I would make this quilt again I loved making it so much, but its huge. I do think I'd like to make a twin bed size at some point, however. This quilt is in my top 10 of the quilts I have made that I (still) love. It was kind of like making many little individual quilts as I built each mosaic. Chelsey helped me lay each group of squares out on the floor and we moved them around to make a pattern that I was happy with. 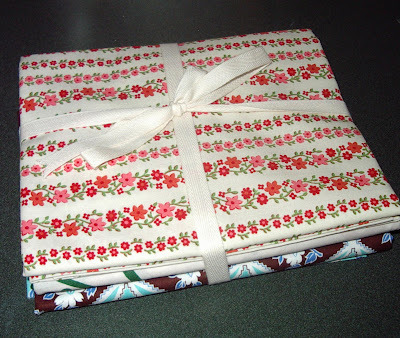 Then last year I decided to make a baby version using a jelly roll my friend Flora gave me along with some other fabrics. Don't you love those jelly rolls? They are great. Thanks again Flora. 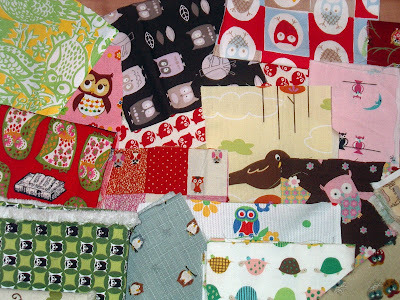 I tend to make a lot of baby quilts but you can never have enough of those. 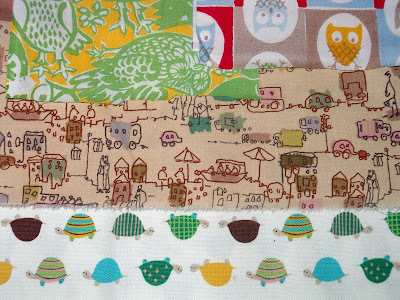 Babies and moms need fun quilts. Inspiring me . . .
All dressed up and no place to go . . . Giving Credit where Credit is Due . . . And kits!